Newspaper senior editor / copy editor: The (Cleveland) Plain Dealer; The National Sports Daily; The Tampa Tribune; The Orlando Sentinel. Baseball: I have watched regular-season games in 43 different Major League Baseball stadiums. I've been to 23 of the current 30 MLB parks, with Detroit, Houston, Minneapolis, Phoenix, San Diego, San Francisco and Washington remaining. Hockey: I've been a season-ticket holder for teams in seven different professional leagues, and for two different NHL franchises -- the Cleveland Barons and the Tampa Bay Lightning. I started the hockey program at my high school, played at the club level in college, did radio play-by-play for the Ohio University varsity team, and was, albeit briefly, an ice-hockey referee. Golf: I've played golf in South Korea and South Africa, and most places in between. I've played at St. Andrews and Pebble Beach, at Bethpage Black and Olympic Club, at Hazeltine National and Orange County National, at Shinnecock Hills and Ash Hills. My lowest round is 1-over-par 73 (twice) at Metrowest Golf Club (Orlando), but my best round is a 4-over 76 at the Old Course (St. Andrews, Scotland). As a journalist I covered many top events, including the Masters Tournament, the U.S. Open, the U.S. Women's Open, the British Open, the PGA Championship, the Players Championship, the World Golf Championships, the Curtis Cup, the Walker Cup, the Izzo Cup, the NCAA Men's Championship, the Spanish Open and the South African Open. 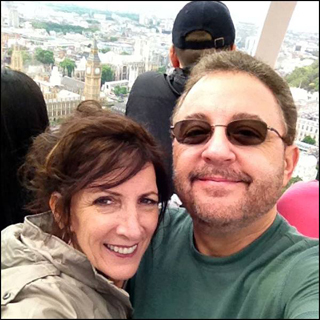 Debbie and I reached our 25th wedding anniversary April 23, 2013, and this summer traveled to Italy and England with friends to celebrate (that's us riding the London Eye). We live in Windermere with our cats, Rocky (Rockefeller) and Teddy (Roosevelt).